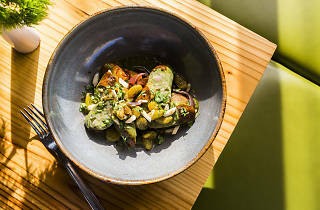 The fact that Quiote stands out in a neighborhood that is teeming with great Mexican restaurants is a testament to executive chef Ross Henke's inventive menu. 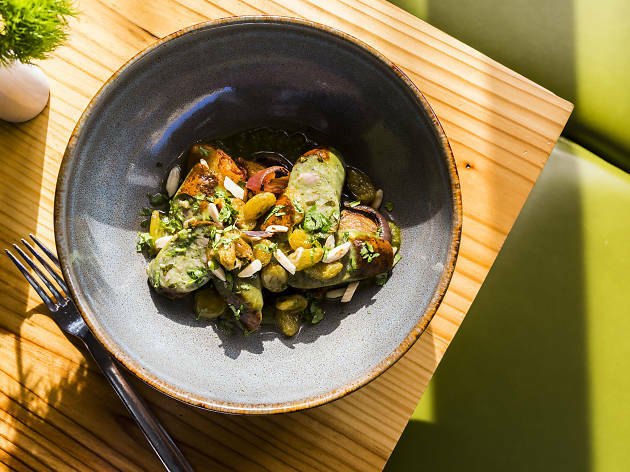 Upstairs, you'll find guests devouring shared plates of regional cuisine, including an addictive avocado salad and lamb carnitas tacos with Japanese eggplant. Downstairs, mezcal bar Todos Santos serves potent drinks, like the Through Being Cool with tamarind, beer, fresh ginger, pimento dram, lime juice and ancho chile salt. I absolutely love this new creative Mexican food spot and mezcal bar. I'm glad I made a reservation even for a weeknight because this place was absolutely packed. The decor of the restaurant is beautiful and the food was amazing. Filling and delicious vegetarian options including an avocado/brussel sprout salad, creamy elotes, and a cauliflower tamal. Reasonable prices for the quality, but if you are a meat eater your bill could run a little high. After dinner, we checked out the mezcaleria downstairs which was a highlight of the night! It is a beautiful, dark and swanky spot and although it took a bit to get our drinks they were boozy, spicy and worth the wait. I'd love to come back here again and try more of the cocktail menu! I have never been treated more rudely by a hostess in my life. I first called Quiote to find out the wait time if we walked in right now, the waitress not only refused to tell me the wait time, she hung up on me! Despite the rudeness on the phone, my friends insisted we go to the restaurant, so when we show up to put our name down, both hostesses were rolling their eyes at us. The manager then told us that it was the hostesses last night working at the restaurant (not very professional). After talking to a manager who definitely did not know what he was doing, we were seated. They sent out a few complimentary items and comped our drinks trying to remedy the situation, but the damage had been done. Food was very good. Avocado salad and esquites fundido were the two best dishes that we had. Also the celery shrub drink was incredible. Definitely will not be back to this restaurant. It's managed horribly. Fantastic!!!! Though I went for the mezcal cocktails, I'll be returning for the food! Shareable plate standouts: avocado salad, crab tostada, verde chorizo! All soooo good and pretty! I can't stop thinking about the food and can't wait to return. Great variety of flavor, and texture in each dish. The mezcal cocktails were also delicious - probably 8 to choose from with unique tastes Service was great - ambience nice - though it was a bit noisy. Upstairs and downstairs bars, which I did not check out, but will upon return. This may just rank as my favorite restaurant in Chicago right now! I freaking loved this place. Chilapan used to be my go-to for upscale latin food, but this place has done it in a whole new way. We waited in the downstairs bar for our table, and got some amazing mezcal cocktails. The whole place is decorated in a perfectly dim lit succulent wonderland. Because our table took longer than expected they ended up comping our first round of drinks while waiting - so nice! Then we sat down and as a result of being 4 semi-tipsy hungry gals, we ordered like half the menu (per the 2 plates per person recommendation of the server). The servings were significantly bigger than expected so we could easily have ordered less, but we ate everything anyway because it was soo good! The brussel sprout salad, the mussels, the chicken mole - all the dishes were on point and delicious!! We will definitely be back - either for another girls night or a date - I loved this spot! Course I had to try the new Mexican place on my street as soon as it opened. I never went to this place when it used to be an Italian restaurant, so I can't say I mourned the change in restaurant concepts. This is a mezcaleria and shared plates restaurant. Mezcal really isn't my thing, but the drink with celery stalk was pretty fresh and crisp. The Hotel Victoria cocktail was a punch in the face haha. The food was excellent, but a bit expensive. Lots of flavorful vegetarian options. We got the eggplant and sweet potato dish, the squash and the green chorizo with potatoes. All of them were great. The bread course is fun, but could use more dips. I'd recommend this place for a date night. Check out the bar in the basement for a pre- or post-dinner cocktail!